There have been many capable women who have contributed to the growth of sustainability, however no one has been a more important figure in recent history than the former Executive Secretary of the United Nations Framework Convention on Climate Change (UNFCCC), Christina Figueres. Figueres tenure at the UNFCCC saw her achieve great things. She was instrumental in negotiations that led to the signing of the historic Paris Climate agreement. She took over her post at the UNFCC in 2010 after the disappointing failure of COP15 in Copenhagen. Five years later she oversaw the signing of the historic accord at COP21 in which 195 countries agreed to limit global warming. Figueres realizes that legislation is the key, "because it is the linchpin between action on the ground and the international agreement". The scope of this achievement is unprecedented. Figueres succeeded in bringing together a wide range of stakeholders. This included both national and subnational governments as well as corporations and financial institutions. To have government and private enterprise come together with activists, NGOs and faith groups was quite an accomplishment. "[We] have the responsibility to set the ethical foundation of our global society. We have done this with slavery and with apartheid. It is time to do it with climate change," Figueres said in 2015. Over the last three and a half decades she has demonstrated herself to be the world's foremost authority on multilateral negotiations. At a result of her stellar accomplishments she has been credited with developing a new brand of collaborative diplomacy. To Figueres credit she did not shy away from criticizing Trump when he withdrew from the Paris agreement less than 2 years later . Figueres called the move "vacuous political melodrama". She also tweeted "Thank you Trump. You have provoked an unparalleled wave of support for Paris and determined resolve on climate action. Deeply grateful." 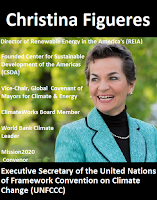 Referring to the Trump administration Figueres said that even if they eliminate support for renewables and double-down on fossil fuels, such a strategy that is doomed to compromise global competitiveness and ultimately fail. Pointing to the private sector and municipal politics she said "leadership on climate change is proving to be remarkably resilient, "
Figueres has also been quick to recognize corporate responsibility as she did in 2013 when she tweeted: "Furniture giant #IKEA capitalizing on #cleanenergy revolution, selling DIY #solar panel kits". As explained in a joint statement by Figueres and Ceres' Mindy Lubber:"The actions needed are legion, but so too are the rewards for investors and companies who make the shift early and embed the transition rapidly." Figueres recognizes that innovation is an essential component of the required efforts needed to address the environmental and climate crisis we are facing. Consistent with this conviction she was a member of the Sustania Award Committee that recognizes sustainability innovation. At the World Economic Forum (WEF) in 2015 Figueres said, "There is no solution for climate without business, but equally there is no business continuity without a solution to climate." At the 2016 edition of the WEF Figueres said: "There is no sector that is not interested in the impacts of climate – no sector that has not woken up to the fact we have a transformational moment." At the 2017 edition of WEF Figueres maintained her optimism pointing to the falling costs of renewables disrupting fossil fuels and the growth of battery storage capacity transforming the world transportation sector. "We are seeing more and more the realization that investment in fossil fuel is actually a high risk, is getting more and more risky," Figueres said in 2014. In her role at the UNFCCC she supported efforts to remove subsidies for fossil fuels. In 2016 she said, "The IMF provides five trillion reasons for acting on fossil fuel subsidies. Protecting the poor and the vulnerable is crucial to the phasing down of these subsidies, but the multiple economic, social and environmental benefits are long and legion." When she received the Fossil Fuel Subsidy Reform Communiqué from John Key, the Prime Minister of New Zealand Figueres said, "These subsidies contribute to the inefficient use of fossil fuels, undermine the development of energy efficient technologies, act as a drag on clean, green energy deployment and in many developing countries do little to assist the poorest of the poor in the first place...low oil prices are a good opportunity to really get going on this issue." 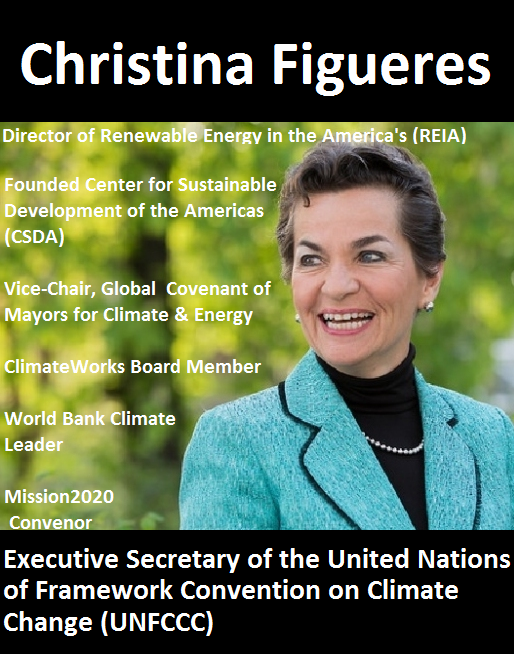 Prior to her role at the UNFCCC Figueres served as Director of Renewable Energy in the America's (REIA) and she also founded the non-profit Center for Sustainable Development of the Americas (CSDA). Figueres is currently working to advance climate action and safeguard the achievement of the Sustainable Development Goals (SDGs). She is currently Vice-Chair of the Global Covenant of Mayors for Climate and Energy, ClimateWorks Board Member, World Bank Climate Leader and Mission2020 Convenor. The goal of Mission 2020 is to keep us on track in the race to tackle climate change before the window of opportunity closes. On April 10th, 2017, Figueres led a group of climate and business experts who said the year 2020 is a game-changing opportunity to turn the tide on the devastating impacts of carbon emissions. This is a smart women who knows what is at stake which is why she tirelessly advocates for urgent climate action. Figueres called the heatwaves, droughts and fires in 2016, "reminders that we cannot afford to do anything except to accelerate the solution agenda - we absolutely have no other option but to accelerate." Figueres believes that the overwhelming logic of climate action transcends politics. "Averting climate change is not part of the partisan debate. We are all united in wanting to live in a safe, stable environment and to provide our families with good jobs that will serve the economy of tomorrow." she said. As she said in 2015, "Investing at scale in clean, efficient power offers one of the clearest no-regret choices ever presented to human progress." Despite her sanguine forecasts, she also offers a dire warning. She says that failing to meet the targets laid out in the Paris accord could unleash, "natural feedback loops from which we may not recover".